Farm Girl Pink....: Fire King shakers.... all kinds of loners... but all are loved! Fire King shakers.... all kinds of loners... but all are loved! This striped Fire King shaker was issued the same time as the red dots/black dots. But I don't recall ever seeing a set of matching mixing bowls for it. Now I have my Fire King Apple shaker. Who also came as a range set. But Fire King did make a matching mixing bowl set for this one. I only own this lonely shaker. Again... I am too cheap to cough up the 30.00 to get a matching shaker for apple or stripes. 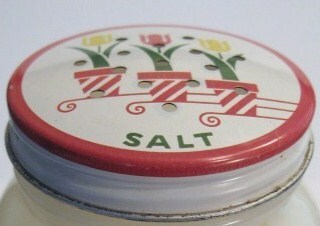 This is the Fire King white ringed shaker. She is new to the family. She actually matches my green Jadite swirl mixing bowl set. She is just in white. And it also was part of a 3 piece range set. That should have these amazing tulip lids. Now this is not Fire King... but I believe McKee. It is custard color. A odd pale yellow. That does not photograph well for me. But she is a lone shaker too. And of course this picture of my random shakers would not be complete without me locating another dang red dot shaker. One day I am going to find those black dot shakers I have packed up.